Hwan Kim serves as the co-head of the firm's International Arbitration Team. He also serves as the International Liaison for Turkistani & Alabbad, the firm’s Saudi Arabian affiliate. Mr. Kim represents some of the world’s largest companies in the construction, heavy industry, power generation, and petrochemical industries. He represents these clients in a broad array of cross border disputes with sovereigns, state owned enterprises, and corporations involving some of their most sensitive problems. He has successfully resolved many high profile international disputes, including by use of investor-state arbitration and by obtaining the support of investor’s government on behalf of his clients. Mr. Kim also advises companies on international transaction, including on cross border investment issues, global corporate structuring, global supply chain, and managing legal risks associated with international business. 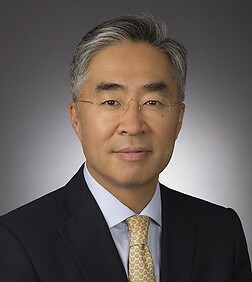 A native of Korea, Hwan has previously served as the Assistant General Counsel for Samsung Group in charge of international legal affairs, General Counsel for Samsung Chemical Group, and the Chief Legal Counsel for Samsung’s Olympic Task Force Team. Represented European Union in connection with a sovereign immunity lawsuit filed in the United States (successfully dismissed). Represented Samsung Engineering Co., Ltd. in an ICSID arbitration against the Sultanate of Oman in connection with a $2 billion petrochemical plant expansion project (successfully settled). Represented Samsung Engineering Co., Ltd. in an $200 million lawsuit against Alcoa, Inc. arising from a $1 billion construction project in Saudi Arabia (successfully settled). Represented Samsung Engineering Co., Ltd. in connection with a $500 million construction disputes with Saudi Aramco (successfully settled). Represented Samsung Heavy Industries Co., Ltd. in connection with its dispute with Nippon Steel and Bechtel (successfully settled). Represented Samsung C &T in connection with its dispute with Qatar Railways Company. Represented the Export-Import Bank of Korea in connection with a sovereign immunity defense over $2.6 billion judgment enforcement proceeding in Washington, D.C. (Peterson, et al v. Islamic Republic, et al) (successfully dismissed). Represented Asiana Airlines before the U.S. Department of Transportation in connection with the crash of Flight 214 to San Francisco International Airport. Represented Samsung Group in connection with a certain U.S. Department of Justice investigation (successfully dismissed). Represented Walter Anderson, accused by prosecutors of the largest international tax evasion in America, on investment holdings related to the indictment. Represented one of the Big Four audit firms in connection with restructuring and consolidating its Middle East operations. Represented a global investment fund form its investment fund in the United States. Advised the Korean National Pension Service, one of the largest sovereign funds, in connection with establishment of its U.S. operations in New York. Advised Samsung Asset Management Co., Ltd. in connection with capital investments from one the largest Middle Eastern sovereign funds. Represented Samsung SRA Asset Management Co., Ltd. in connection with investment in real estate assets in the U.S. Advised POSCO, one of world’s largest steel producers, in connection with its investments in the United States. Advised U.S. oil shale developer in connection with the financing of a petrochemical refinery by international investors. Represented several international power generation companies, including EDF EN, in connection with procurement of wind equipment from overseas, including turbines, towers, and power generation related equipment. Advised a major international steel producer in connection with its negotiations of the global supply agreement with GM and Chrysler. Represented Samsung Motor Company (before bankruptcy) in connection with overseeing the structure and drafting of its global supply agreements and supply chain. Represented Samsung Electronics Co., Ltd. in connection with its Olympic sponsorship and matters relating to the International Olympic Committee. Represented Korea International Trade Association in connection with the ratification of the Korea-US Free Trade Agreement. Construction and Infrastructure Law Blog Posts.